"These are the nameless larvae of the Other Gods, and like them are blind and without mind, and possessed of singular hungers and thirsts. Discovered in Budapest, Hungary, by the famous explorer Stapleton McTavish, it was part of a huge occult book collection of the now deceased Philanthropist Janos Zoltan Wagner, it is thought to be one of the missing pages from the dreaded Necronomicon. The strange text appears on a number of recently discovered papyruses all found in different parts of the world. Prop handout for Call of Cthulhu or any other Mythos or Horror RPG. To use as a handout in Roll20/VTT - Upload the PNG version to Roll20 Handouts. To use as a handout in Call of Cthulhu/Horror RPG - Print PDF as double sided document. (see the Alternate preview) Cut/tear around the edge. If printing on white paper you can use a brown felt tip around the edge to hide the paper. Fold it and crumple it until it looks old. 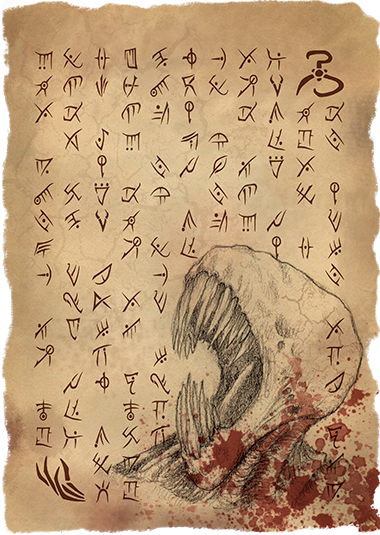 Check out more pages from the blasphemous Necronomicon. This title was added to our catalog on January 21, 2015.